As an affordable add on to SDScribe™, we offer Inventory and Production Manager, a powerful tool for inventorying your raw materials and finished products, preparing batch and recipes sheets, and even purchase orders. Quick inventory to set stock levels. In the same software as SDScribe™! Save time not having to install more software. Quick inventory maintains part and ingredient (raw material) stock levels for your warehouse. 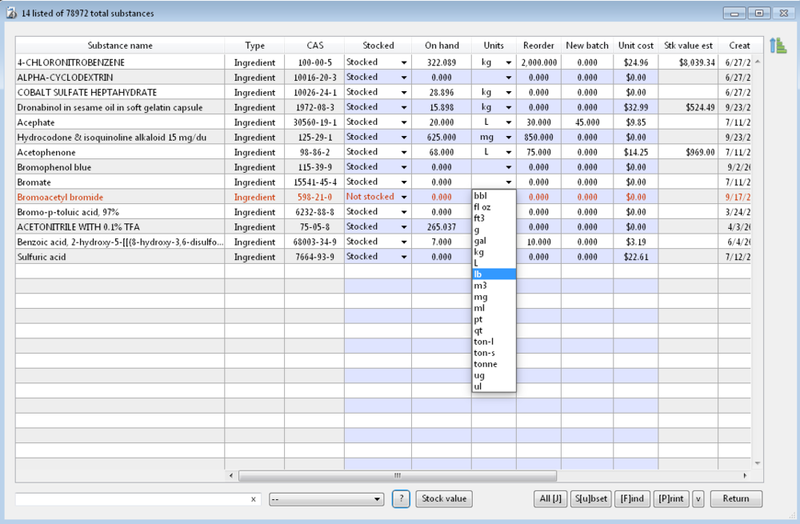 Set reorder levels for parts and ingredients, and generate reorder reports. Automatically generate multiple purchase orders from parts and ingredients that are below reorder levels, or generate individual purchase orders by selecting parts or ingredients. Create production batches that allocate against raw materials stock, and place product into finished goods stock. Generate batch sheets (BOMs) for the workers to use during production. Calculate per-bottle costs (including parts, ingredients, labor, and markup) of a production run. Maintain batch history including lot numbers, task dates/times, spillage, and remarks.